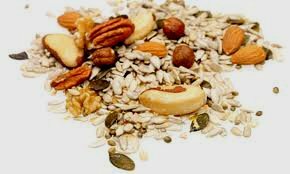 Seeds, nuts and grains are the storage form of the plant. As such they contain Divine preservatives that retard their deterioration so they can be stored for food for the winter (or famine) and/or planted the following year. (In Egypt during the famine of Joseph’s time some of the grain was in storage for 14 years.) These Divine preservatives need to be deactivated before eating by the simple action of soaking in water to begin the sprouting process. This turns the grain into a vegetable or sprout following many chemical reactions within the nut/seed to reverse the inherent storage qualities. Traditionally grain was handled this way, that is, soaked until soft, then pounded into a dough that was risen, then baked. This is basic Essene bread. Today, this process is bypassed and the dry, unsprouted grain is sent right to the mills. I believe modern grain products are a lot less digestible because of this missed process and perhaps the cause of blood sugar dysregulation (diabetes), gluten intolerance and other ills of our day. Of note is that sprouted wheat breads (Ezekiel) do not cause blood agglutination as do other non-sprouted breads, especially for the O and B blood types. Similarly nuts should be soaked for about 24-48 hours and then stored in the refrigerator prior to eating or baking. I have found that this makes almonds easier to chew and walnuts less bitter. So, be kind to your grains and your grains will be kind to you! Proper traditional preparation of grains and nuts prepares them for digestion by neutralizing their natural preservatives using moisture, warmth, slight acidity, and time. These 4 important ‘food conditioners’ help neutralize digestive inhibitors and irritants (Phytic acid (grains), enzyme inhibitors (nuts), fiber) and make the grain easier to digest. Consult with Sally Fallon’s book Nourishing Traditions for how to prepare foods that are kind to the digestion and nourishing too. I crave nuts, especially pecans, and eat raw nuts. Not sure why. I would rather have nuts than sweet items or carbs. So this article seems to say I have to soak the nuts I eat, correct? I do store them in the freezer. Is soaking simply for ease of digestion? Also, I do eat Ezekiel bread and their other products. Yes Kay, I would soak them to get them out of the storage form and into the vegetable form of the plant. I have found the nuts easier to chew and digest, and, for the walnuts, they lose some of their bitterness. Ive been trying to find a good recipe for sprouted bread and Ive come across some recipes that suggest soaking whole wheat flour already ground up (with water and an acid)for 12-24 hours. Do you think this would provide the same benefits for digestion as sprouted bread? It certainly seems easier to make! You cannot sprout wheat flour. The germ structures in the seed that produce the chemicals for sprouting and making a vegetable out of a seed are completely scrambled when ground to a powder. I realize it won’t sprout but I suppose the theory is that soaking already ground flour still neutralizes the phytic acid, even though its all ground up. But I’ve also seen conflicting information. So I wasn’t sure if the sprouting was more important than the soaking or if its a means to the same end. What I was referring to are the cellular processes within the seed that ‘neutralize phytic acid’, that is, it is not just the water; it is the life process within the seed (activated by water) that is assocoated with the cellular structures within the seed itself, which will eventually result in sprouting through a series of chemical processes. In other words, it is the process of sprouting that results in the chemical reactions that neutralize the preservatives within in the seed. For these biological processes to happen, you need water plus the whole intact seed. I am wondering about the sprouting – by the same token that flour can not be sprouted, it seems that ROLLED oats and SHELLED nuts can not be sprouted either? Or am I missing some difference? You are correct about the rolled oats although some benefit may be realized from soaking in a low pH water. Shelled nuts can be sprouted though as that part is the intact seed. The shell is the protection but the nut is the actual container of life. Hey Mary, I am not aware of any health benefits to drinking the water. When soaking grains the water should be switched out for fresh often. Once the seeds and grains are soaked for 24/48 hours can they then be dehydrated for storage with good nutrition and digestion in tack? The seed and grain is THE best storage form. I would leave it in that form until I am ready to use it. If the purpose of this effort is to make a snack (and not put it in another storage form) I’d just try it.